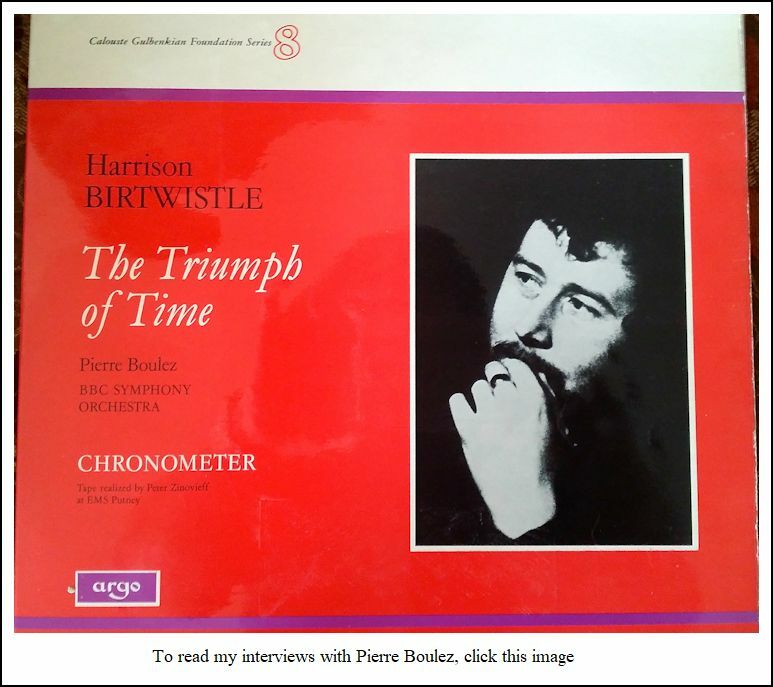 Sir Harrison Birtwistle Interview with Bruce Duffie . . . . . . . .
Birtwistle was in Chicago in October of 1996 for performances by the Chicago Symphony Orchestra of The Triumph of Time, conducted by Barenboim. They would also give the world premiere performances of Exody the following season. It was during the 1996 visit that I had the opportunity to sit down and have a conversation with the composer. He was generous with his thoughts, and made sure that his points were coming across as he intended. Here is that chat . . . . . . .
Bruce Duffie: You are a composer, so you don’t have quite the travel problems that performers do, but you just said you had a rather poor trip from London to Chicago. Does this in any way affect either the music that is being performed now, or the music that is still to come out of your head? 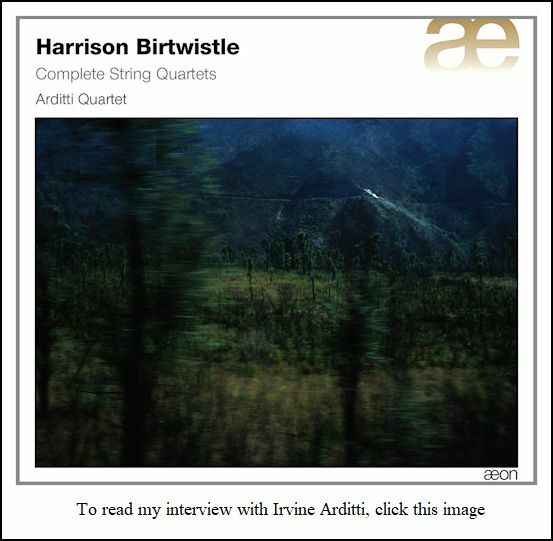 Sir Harrison Birtwistle: I can’t say. I’ll let you know! [Both laugh] No, it’s just unfortunate that a mistake was made in my travel arrangements. It took me twenty-four hours from London. BD: Does the daily grind of living — everything that happens in your daily life — affect what winds up on the page? Sir HB: I have a fairly sort of funny life in my working arrangements. For instance, I haven’t done any work for about eight months, but then previous to that, I’d worked every day for three years. I’m not a person of habit or pattern. BD: Is it by design that you’ve not worked for eight months, or is it just that nothing has come to you? Sir HB: No, no, no, it’s circumstance. If you can talk about the creative thing, it goes on even when you’re not actively doing it. 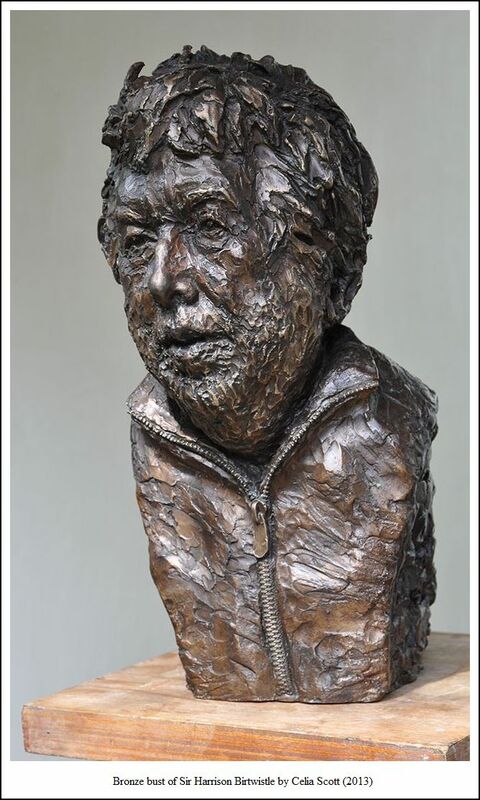 But I did have a very big festival in London of my works in the Spring, and I worked up to that point. I’d done a lot of work, and so maybe it’s the time in life where a page is turning, but I can’t say. People always think that creativity is something where you’re free. One always thinks of creativity as being free, but I don’t think one is free at all. BD: Is it a burden? Sir HB: Oh, no, it’s not a burden! It’s neither one thing nor the other for me. It’s what I do, and it’s what I always have done. So, it’s my life, and like all things in life, there are splendids and miseries attached to it. BD: Did you select to be a composer, or did it select you? Sir HB: I came from what used to be called a ‘working-class’ family in the north of England, and my mother sent me to have lessons to play the flute. She said it would keep me off the streets, and the flute turned out to be a clarinet. As soon as I learned notation, I wrote music. It never occurred to me not to. It seemed very natural. The only time I stopped writing music was when I won a scholarship to study, and that was the time when I stopped composing when I was a student. Sir HB: I’d written fairly consistently since the age of about fourteen to eighteen, and that’s a long time. So, when I was confronted with the official line of what music was, I couldn’t find the relationship between what I was taught and what I’d done. BD: Did you discard the early works? BD: So you were right all along? Sir HB: I don’t know whether it is right or wrong. After being subjected to a musical education, it was the question of picking up the threads again, but things had changed. I didn’t simply pick up where I’d left off. BD: You had grown a little bit? Sir HB: Yes, I’d grown, but you think that things don’t influence you, or you think you are growing, but it doesn’t work quite like that. There’s an evolutionary process that happens. You’re not the same person, so no matter, even if at the time I thought it was a negative thing, coming out of it I don’t think it probably was. But it was a strange time. It was not a happy time for me. BD: Did it become happy once you got out of school and started working? Sir HB: What I did was write a piece of music, and then I went into the Army for a year to do National Service. I spent two years in a band. Sir HB: Yes, marching up, backwards and forwards for no apparent reason — what you do in bands. It is slightly straighter in England than what you do in America, I’ll have you know. I always notice that the America soldiers are more relaxed in the way that they march. We are much stiffer, and then when you get into Germany, if you remember, they march very stiffly! [Both laugh] I make no comparison or comment about this. It’s just an observation. BD: Is there any relative use of sound or music, that it’s more relaxed in America and a little stiffer in England, and still more stiff in Germany, or is that a spurious argument? Sir HB: I don’t know. The history of English music is strange. BD: It sort of starts with Purcell, and then jumps all the way to Stanford, Parry, and Elgar. Sir HB: Yes, that’s right. There is also this question of people trying to invent music, like Vaughan Williams, when there was no real tradition. What do they do when they want to invent a tradition? 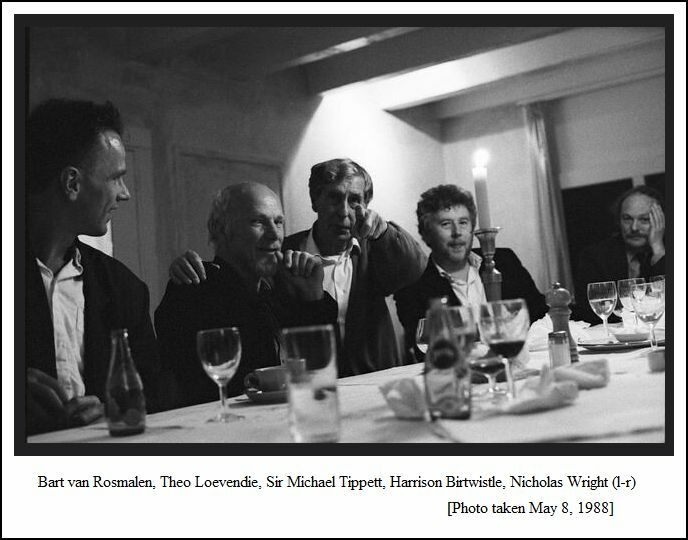 They go to folk music, and it was composers after Vaughan Williams — like Britten and Tippett — who went really back to Purcell. That’s where they wanted to pick the threads up. But, as I said, like my education, you don’t simply start where Purcell left off. You can’t do that. BD: Are you part of any kind of tradition, either a British tradition or just a general music tradition? Sir HB: As an arrogant student, I consciously rejected English music. Last year, when I won the Siemens Prize, I had to do a lot of interviews, and a big majority of them asked this question — though it’s really a statement — if I realized my music was very ‘English’? Since it’s the one thing that I rejected, I didn’t really know how to answer, and I can’t really tell you what the tradition of music is in England. You can’t talk about a tradition if there isn’t one, so maybe English music is becoming more like me, rather than me like it! [Laughs] I don’t know. BD: Obviously, this is not anything you consciously work for. You have your own, music, and what happens, happens. Sir HB: Yes, that’s right. You can’t make a self-conscious thing to belong to a tradition anyway, and I don’t think do you do it by simply aping its exteriors, like traditional architecture. They think it’s traditional if you put Greek columns in front of it, or you belong to a tradition because you deal in the symphony. BD: I’ve often tried to argue that theory comes after the actual composition. You have people writing and then they put the labels on it. Sir HB: The theory is by somebody else. A lot of students make the mistake in thinking that composition is like theory and analysis. That is backwards. BD: That really gets the cart before the horse. Sir HB: Yes. It is something you play like a game. I can only be subjective about this. The trick is to play a game between very severe formalism, if you like, and something absolutely intuitive, and use anything in between. In a sense, you don’t have to justify anything, only the finished thing. BD: When you are putting the ideas down on paper, are you really creating and working with these ideas, or do they just come to you, and you are surprised by what you see on the page? Sir HB: ‘Hear’ is a better word. I always feel that I’ve been writing the same piece and that I’ve only got one idea. There is something that happens over which you have no control, and so what happens is that something evolves, something that you’re not controlling. But the place where you start from, or, to be subjective, the place where I start from, always seems to be the same place. BD: And then you go off in a little different direction? Sir HB: Yes. The piece becomes like an identity, or like a child, or like something that grows. But to think that composition is like a building which you make like architecture — you make this plan, and then what you do is fill it in — it’s not like that. It doesn’t look like that for me, though I know that some people write music like that. BD: When you start out, do you have any idea how long the piece will take to write, or how long it will take to perform? Sir HB: No. If I’m writing a piece for orchestra, you’re going to assemble a large body of people. So, it’s to do with the way the music speaks, and when you feel that it’s right. But maybe I’m like one of these painters who only paint pictures as high as themselves. [Laughs] I’ve got a twelve-minute time, and I’ve got a twenty-minute time, and a half-hour time. BD: So if they commission you for a half-hour work, you go into your half-hour mode? Sir HB: Well, nobody’s ever said that. Nobody ever said how long it needed to be. BD: They just say write a piece? BD: Then how do you decide if you’ll say yes or no? Sir HB: It’s trying to make the piece into the thing that I want to do at that moment. Or, if someone asks if you are going to write a piece in a year’s time, or two years’ time, then the idea becomes the piece. I don’t see myself as being an artisan. I can’t do that. People have often asked why I can’t compromise in my things, because I write difficult music. I say that I don’t know how to compromise. What I do is all there is, and I thank God for that. BD: So you don’t set out to write something difficult, you just write what you have to write? Sir HB: No, no! I just make it as easy as I can. ‘Clear’ is a better word. I try to make the idea clear. BD: Is your score littered with external directions and expression marks — the non-notes — or is it mostly just the music, and you let the performers get on with it? Sir HB: Not non-notes, no. I believe the traditional notation is very elegant. There’s been a lot of different notations invented, and I’ve not yet heard a piece that could not be notated in what I would call traditional notation. There are certain things that I do indulge in that are not traditional, but by and large, I don’t. I’m a traditionalist in that sense. BD: When you give the piece to the performer, do you expect it to sound a certain way, or do you allow the performer a little leeway for interpretation? Sir HB: Interpretation is a funny thing, especially for the great performers. I listened to Alfred Brendel playing Beethoven the other day, and one thing about that was that it sounds like Beethoven’s Beethoven, not Brendel’s Beethoven. It’s the sort of performing that I really admire. Very often when we talk about interpretation, you hear somebody’s version of the composer’s music, and that is not the sort of thing that interests me. It becomes a vehicle for them, rather than them being a vehicle for the music, and it becomes, then, a version of what it is. BD: This is what I’m looking for. How far can it be pulled before it becomes a perversion? Sir HB: I came to rehearsal today of Barenboim doing my piece. He has such an incredible ear. There’s no doubt about it because he can hear the balance of chords, and also the relationships of dynamics. 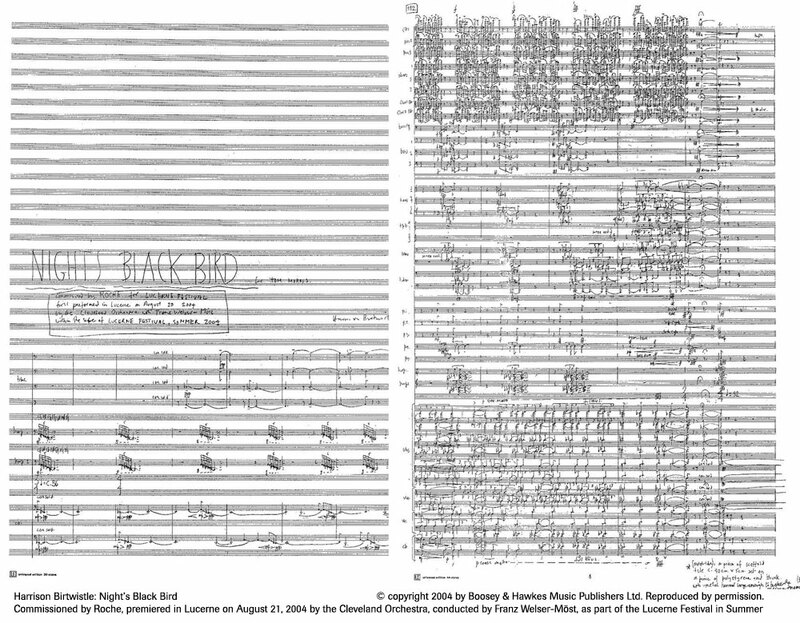 Now, is this ‘interpretation’, or is interpretation something whereby you say, “I’ve got an idea about this, and it’s not what the composer put down.” What I call interpretation is when somebody can hear it, and interpret the symbols on the page. BD: Is there such a thing as a perfect performance of your work? 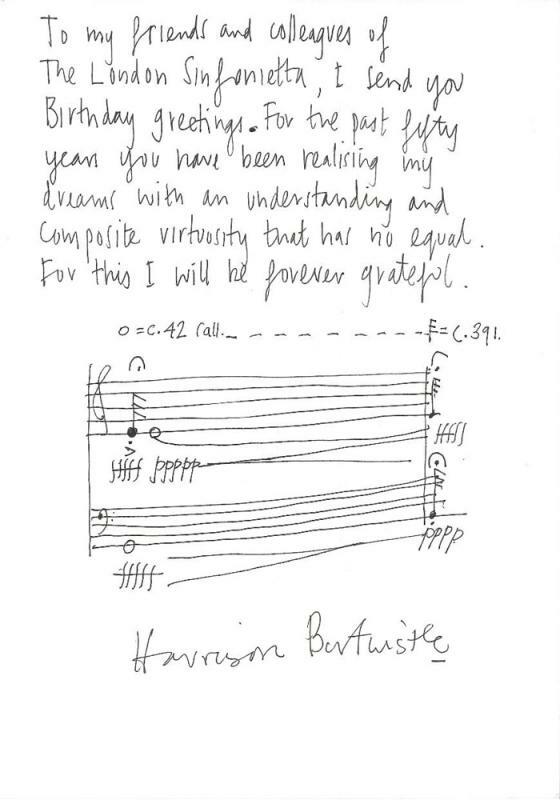 Sir HB: Not any more than any other piece of music. What you do in performance is get facets. You can never get the whole thing. Also, there is this question of personality. That’s something else you get. There is something more than the notes, but if you were pushed to say exactly what it is, it’s often difficult. If you listen to Mitsuko Uchida, who’s played my Piano Concerto, she has a definite style of playing. If you played a CD of her, I think I could tell it was her. But it’s not something by which you could say exactly what she’s doing. It’s a rhythmic thing, I think, more than anything. BD: If someone else were to come to the Piano Concerto and pull it all out of shape, would you discourage that person? Sir HB: Of course I would, absolutely. That’s not interpretation, that’s perversion. BD: Would you discourage them doing what they’re doing, or discourage them from playing your music at all? Sir HB: [Smiles] Well, I can never do that! But what do we mean? It’s an interesting point. In classical music, it’s usually to do with tempi more than anything, but I’m not sure. BD: Tempo and rubato especially? Sir HB: Yes, but rubato is something particularly concerned with Nineteenth Century music. BD: Have you basically though been pleased with the performances you have heard of your works over the years? BD: I won’t pursue that any further, but I will ask if you are basically pleased with the recordings that have been issued, because they have a certain universality? Sir HB: You might not believe this, but I’ve not really heard too many of them. I don’t listen to them much. BD: You’re not involved in the recording process? Sir HB: Yes, I’m very often involved in the recording process. BD: Then, obviously you must approve it at some point, and after that you let it go? Sir HB: Yes. It comes back to the analogy of the children. At some point, you bring them up, and they go out the door, and they have to make a life for themselves. BD: But the record doesn’t continue to grow. Sir HB: No, that’s what’s wrong, whether it grows or not. That’s the problem with recordings. [Laughs] I’m the enemy of recorded music. BD: [Being mildly shocked] But I trust that won’t stop you from having your pieces recorded!? Sir HB: [Smiles] Oh, of course not, no. But in the end, performing is about a physicality. It’s about something live, and it’s not the same thing in a recording. Recording is like a reproduction of a painting. You can’t smell the paint. It’s one-dimensional in a sense. BD: Would you ever write a piece expressly for a record, rather than for a live performance? 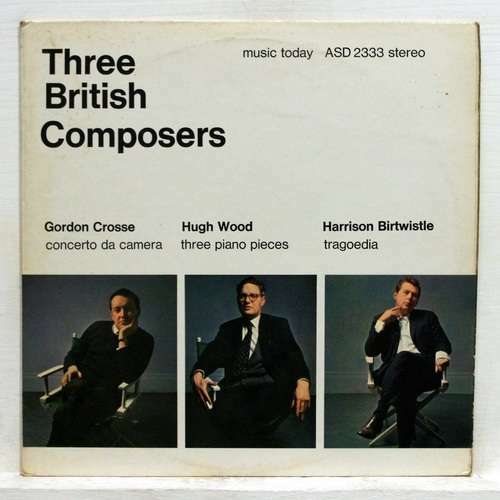 Sir HB: No, but it’s an interesting idea because the whole question of balance comes into it — like movie music, for instance, where you suddenly hear a flute in the middle of something which is taking on the whole orchestra. You could do that, but essentially I’m an acoustic composer. BD: Have you worked with electronics at all? Sir HB: Yes. I wrote an opera, The Mask of Orpheus, and there’s a huge electronic part in that. That was done in London recently. BD: Is that a part for someone manipulating the electronics, or is it laid down on pre-recorded tapes? Sir HB: It’s all very primitive in that sense. It’s sort of steam electronic music. BD: I just wondered if eventually we should have a virtuoso electronic technician, just like we now have a virtuoso violinist, and a virtuoso bassoonist? Sir HB: I think there are such things even now, yes. BD: We’re kind of dancing around it, so let me ask the big question straight on. What is the purpose of music? Sir HB: [Thinks a moment, then remarks on the pause] Long silence! [Continues his silent consideration, then verbalizes his thoughts] For one thing, it’s unique, isn’t it? It expresses things that you can’t express in any other way. I don’t know, maybe it doesn’t have any purpose. Whatever purpose it has, it is in great danger of being devalued in the way that sound is treated. It becomes like the wallpaper to our lives. It’s on in restaurants. It’s on wherever you turn, and has nothing to do with the quality of it, but just the idea that there is some sort of music going on. You pick up the telephone, there’s something. If you go through the airwaves, it’s like garbage — it’s all up there, and consequently there’s a result that music simply becomes wallpaper, and we don’t listen to it. It’s something that we have on, and if you make a complaint — for instance, in a restaurant or something — they say that everybody demands it. But people don’t demand it! However, as soon as you turn it off, then they want it, but they didn’t even know it was on in the first place. Consequently, look what happens if you write a piece of music which is, to some extent, against that; a piece of music like mine that they’re playing here in Chicago, which demands a concentration. It’s to do with the drama, or having a beginning and an end. It’s to do with many things, and people can’t accept it on that level. It would be very easy to write the sort of music which would simply replace that satiation in the way that we listen to classical music — whether we really do, or perhaps we just become familiar with it. Do we ever question whether a piece of music is a good piece? I remember being in Cleveland where they were also playing the Dvořák Cello Concerto. I was talking to them about my piece, and I mentioned this point, and asked if they questioned the fact that as to whether the Dvořák Cello Concerto is a great piece of music. This was sort of arrogance, and I said, “Consider the ending. I think that it’s an absolute cop-out! Is this the right ending for the piece, or could it have been something else?” I happen to think it’s a cop-out, and it doesn’t work. What was happening there was that nobody had ever considered that maybe Dvořák was capable of doing anything wrong. BD: Then by the same token, should we question your music, and ask if it has validity and greatness? Sir HB: You can do that, and you can listen to it and find out for yourself! BD: Is this the advice you have for the audience — to open your mind and question it? Sir HB: Well, to listen to it before you question it! [Both laugh] It’s a very interesting thing, and it’s a very exciting thing, the whole question of music now. 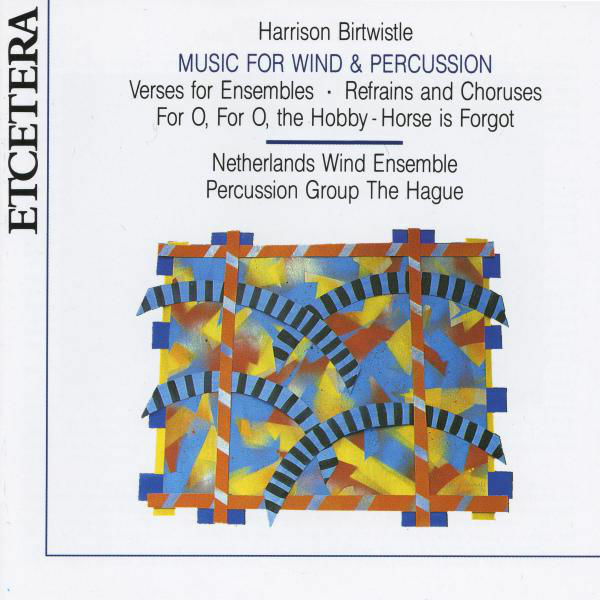 I find Contemporary Music much more interesting than Classical Music. BD: Would you rather have your works on an all-contemporary program, or a single-composer program, rather than a mixed program? Sir HB: It depends on what the mixture is. This mixture this week is a very strange one, very strange bed fellows. Sir HB: I get on with Bach, and the Tchaikovsky is my favorite piece of his. But then again, Tchaikovsky is not one of my people. BD: [With a gentle nudge] So it’s the best of the worst? Sir HB: That’s right. [Both laugh] I have a problem with Tchaikovsky, but maybe he’s got a problem with me. That’s more than likely. BD: When you’re writing a piece, do you have any consideration of the audience who will listen to your work eventually? Sir HB: No, because that smacks of compromise. How could I? Hopefully I’ve got a valid idea for a piece of music, which I do as clearly and as well as I can, so where does the audience come into that? BD: Perhaps when you write a particularly good phrase, and think the audience will like it. Sir HB: No! I couldn’t say. Which audience? When you talk about it, if there is a sliding scale, where do you draw the line between which member of the audience is going to like it? No, there is only the ideal. BD: I assume that you write originally for specific performers, and hope that other performers will be able to interpret it? Sir HB: Yes, of course. BD: You mentioned one of your operas. What is the secret for writing for the human voice? Sir HB: It’s the most expressive thing there is, and it has many forms of expression. You are the nearest to nature in the voice even though language changes. How language changes is the way that the music sounds, or the way that folk music cultures the voice, or the voice cultures the music. Maybe it’s the other way round in ethnic music. The way that the voice is produced is inseparable to the music, and the music is inseparable to the voice. Sir HB: Both. The thing about a text is that you know where the beginning is and the end is. It has form which you’re given. I’ve tended to work with text, whereby I try to express not just the mood of the text, but also the form of the text. Therefore, I tend to look for song texts in things where maybe the meaning, to some degree, is ambiguous. I’ve done a lot of settings of Paul Celan (1920-70). His poems were written in German, but I set them in translation, and then they’re translated back from English into German. So you can sing them in German, but they’re written in English, because that’s to do with my voice. Because I don’t speak German, there’s a sort of double translation work in the songs. BD: Does the singer or the performer then have to alter notes or rhythms just a little bit to accommodate the text? Sir HB: Just a little bit, yes. I expect that because there are usually more syllables in German. BD: You’ve also written operas, and this adds the dimension of stage action. BD: I’m sure they were flabbergasted. Sir HB: Yes, but it worked out in the end. BD: What opera did it become? 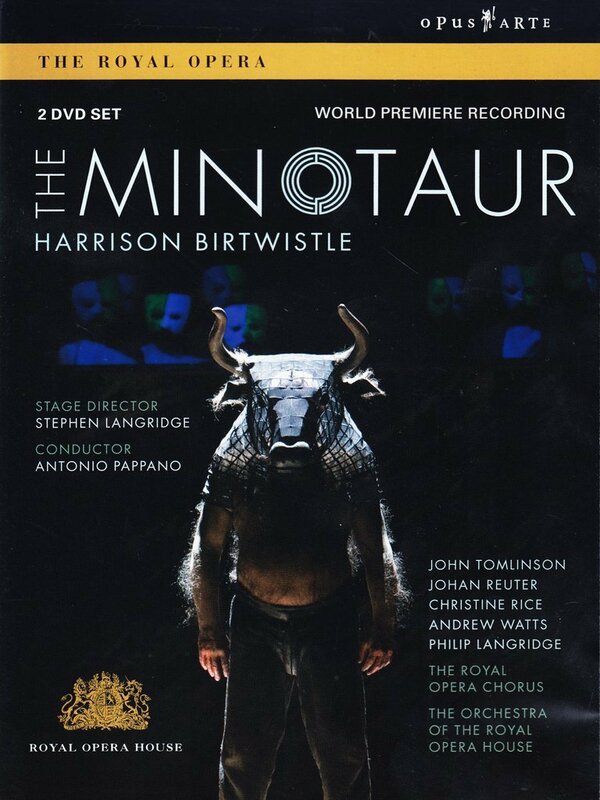 Sir HB: It became Orpheus because I was wanting to deal with a myth, and I wanted to deal with the myth that had many different versions, so that I could write an opera about everything. It is a myth in its totality. It’s not just one line tracing to take you through it, and you do that. I thought the myth of Orpheus was much more interesting in this respect. It’s a mega-myth, and it also is about music. That’s the other thing — it’s about music being given to someone, and then it being taken away from them. BD: Did the others at the meeting take a lot of convincing? BD: I am glad they were flexible. Sir HB: It didn’t matter in the end, but I sight this as an example of my way of thinking about it. BD: You mentioned that with text you know the shape and the form because that’s imposed by the text. When you’re dealing with purely abstract music, how do you know you’re finished? Sir HB: When you take a line for a walk, you sort of know when it’s made a point. It’s to do with my sensibility about myself. I have written music where I feel it is too long, and I have one particular piece where I don’t feel it’s long enough. BD: Usually composers find to make snips here and there. Sir HB: Yes. Schoenberg said something to the effect that when a piece is too long, even the first note is too long. It’s not a question of cutting, it’s taking a knife to it. BD: I wonder if someone would be able to use the computer just to compress everything slightly, rather than snip, snip, snip? Sir HB: It would be the same thing, would it? It would be a distortion. But pieces change. I don’t think there’s a finite thing for a piece of music. There are performances that sometimes work, and sometimes they don’t. BD: So then we come back to this idea of interpretation, and then it has to convince you, and if it convinces you, it works? Sir HB: I’ve heard performances of my piece The Triumph of Time which have seemed too long, when in fact they’ve been shorter than other performances which seem too short. So, it’s not a question of how many minutes, it’s about something else. BD: It’s about putting your ideas across? Sir HB: Yes, it’s about how the piece speaks, and how you deal with the tensions within it, and how things are unfolding, or just being disclosed. BD: Can you then go to the conductor and nudge him a little? Sir HB: Oh, it’s too late, because it’s a performance. BD: What if you were there for a rehearsal? Sir HB: Oh, no, rehearsal is not a performance. You can’t control things like that in rehearsal. That’s where we come back to what performance really is. There are only certain things that you can do in rehearsal, and there are other things that can only be done in performance. You have this luxury in America, which I’ve had a few times. I’ve had it in Los Angeles and with the Los Angeles Orchestra, and in Cleveland, where you do four concerts. Then, there’s the other thing, which is the audience. The chemistry of audiences is an interesting one. The same piece of music is different with different audiences. It feels different, and when I’ve done some conducting I’ve felt that. You go out there, and you get a sense of something, some sort of chemistry or electricity, whatever you want to call it. Either they’re with you, or they’re not completely with you. BD: So the audience does get taken into account on the night of the performance? Sir HB: Oh, yes, sure! They make it count. BD: I hope you’ve had good audiences, generally. Sir HB: Don’t expect anybody to like it, or want it. BD: So perseverance seems to be the by-word. Sir HB: Yes, you gotta want to do it. Then it doesn’t matter. BD: Do you have any advice for performers of your music, or other new music? Sir HB: No. I think performers are so wonderful. There are people who are more close to contemporary music, if I want to open that can of worms, but we started this conversation talking about interpretation. It’s a funny word, ‘interpretation’, because the best performers don’t interpret, but they bring something to it. I think I’ve already said that. They bring it to life. It’s not just an abstraction, because as composers we’re dealing with hieroglyphics. There’s always this middle-man at the performance. That’s the marvelous thing about painters, they just put the mark and you see it. It’s fantastic. BD: But you’re dealing not only with the interpreter but also with time. You can look at a painting for a moment, or for a day. Sir HB: Or, you can take it all in at once, or part of it, and in music you can’t do that. If you’re dealing with a big orchestra, for instance, it might take you two days to write seven seconds. You can very often convince yourself this is going to last a long time, and it’s gone in a flash. It’s gone and you wonder what the problem was. BD: But you hope that it makes the impact that you want? Sir HB: Of course, absolutely. I do that all the time if I know what the impact is. BD: Has the conference of a knighthood affected your music in any way? Sir HB: No. It was a very difficult decision. My first instinct was not to accept it. Sir HB: It’s to do with the Establishment. I’ve never been a member of the Establishment. Maybe I’ve become a member of the Establishment in one way, but I don’t think my music has, and so that was a problem. BD: Obviously there’s someone in the Establishment who must have thought you deserved it. Sir HB: Yes, I suppose so. We’re funny where I come from. You simply don’t know where these things come from, or whose idea it was, or why. But I had a problem with it. I knew all the people that would be against it, so I didn’t need to ask them what they thought about it because I knew what their answer would be, and the reasons why it wouldn’t be good for me to accept. BD: What, then, finally convinced you to accept? Sir HB: You accept not just on behalf of yourself, but on behalf of everyone. I sort of feel that I could then be the enemy within, as it were. BD: Since you are then recognized as Sir Harrison, some people who wouldn’t ordinarily listen to your music will listen to it, and maybe be impacted. Sir HB: Oh, not just listen to the music, listen to me! That’s the point, since you asked me what the difference is. One thing that has happened is that you say something, and people take notice. Maybe they’re being rather foolish, but that sometimes happens. I asked Peter Hall, the director, and he said it hadn’t made any difference to him. 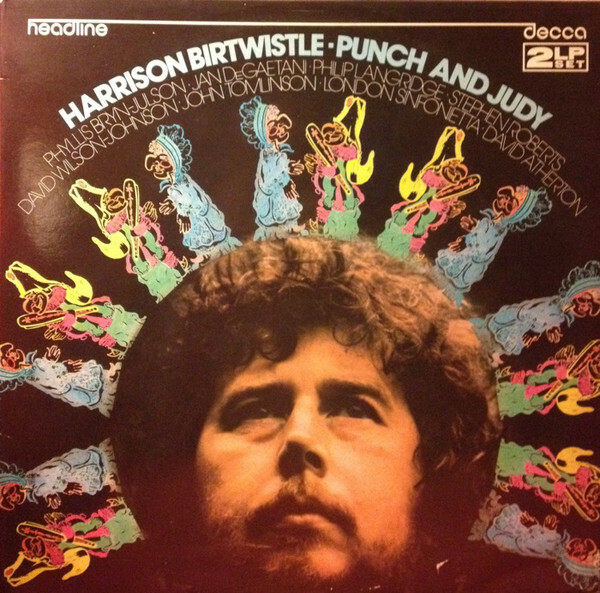 But he advised me to go to a printer’s and get some headed paper, and put it on the list that it’s Sir Harrison Birtwistle. Then, whenever you’re dealing with people like your bank, or the electricity board, then use that paper. That’s the only use it could possibly have. BD: [With a gentle nudge] It’s an unearned privilege? Sir HB: [Smiles] Yes, but I’m being a little facetious. BD: I assume that in the end you are glad you accepted it? Sir HB: Yes, but I don’t feel it has made any difference. Sir HB: Yes. In the end I’m optimistic, yet I am very concerned about it because it’s going to change, and I think the structure of music will change. I don’t mean music itself, but the way orchestras operate. Something is going to happen there. I’m an optimist about creativity, not about music, and if I’m optimistic it’s because creativity never comes from where the academics think it’s going to come from. What’s that expression you have over here about American baseball? BD: It comes from out in left field! Sir HB: Yes, that’s right. It never comes from where you think it’s coming from, and that’s one of the fascinations of it. That’s what makes us into human beings. It’s one of the things that keeps us apart from the animals. BD: Do you think your music will survive the change? Sir HB: I’ve no idea, and I don’t care. BD: [Mildly shocked] You don’t??? Sir HB: No. I can only do what I do, and I can only do my best. BD: Thank you for doing your best all these years. Sir HB: Well, it would be terrible if I didn’t, wouldn’t it? BD: Thank you so much for coming to Chicago, and for speaking with me today. This conversation was recorded in Chicago on December 8, 1996. Portions were broadcast on WNIB in 1998 and 1999. This transcription was made in 2019, and posted on this website at that time. My thanks to British soprano Una Barry for her help in preparing this website presentation.